PayPal Completes Acquisition of iZettle | PayPal, Inc.
SAN JOSE, Calif.--(BUSINESS WIRE)-- PayPal Holdings, Inc. (NASDAQ: PYPL) announced today that it has completed its acquisition of iZettle for approximately $2.2 billion USD. This transaction builds on PayPal's strong set of products and services for small businesses and is intended to help accelerate growth and deliver a seamless commerce experience for merchants. "We're thrilled to welcome the iZettle team to the PayPal family and are excited to expand the ways we serve our small business customers," said Bill Ready, chief operating officer, PayPal. "iZettle brings a suite of products and services that allows merchants to meet their customers where they are - online, in store or via mobile. This is another step in our journey toward democratizing commerce tools to help businesses of all sizes thrive." "Today is a very big day - for me and for everyone at iZettle," de Geer said. "We share PayPal's strong belief in the power of small businesses. Together, we will be stronger and move even faster to help small businesses succeed in a world of giants." Prior to the closing of the acquisition, the UK Competition and Markets Authority (CMA) initiated a review of the transaction. PayPal is working cooperatively with the CMA as it conducts its review. PayPal and iZettle brands and operations will be held separate as agreed with the CMA, pending completion of the CMA's review. Fueled by a fundamental belief that having access to financial services creates opportunity, PayPal Holdings, Inc. (NASDAQ: PYPL) is committed to democratizing financial services and empowering people and businesses to join and thrive in the global economy. Our open digital payments platform gives PayPal's more than 250 million active account holders the confidence to connect and transact in new and powerful ways, whether they are online, on a mobile device, in an app, or in person. Through a combination of technological innovation and strategic partnerships, PayPal creates better ways to manage and move money, and offers choice and flexibility when sending payments, paying or getting paid. Available in more than 200 markets around the world, the PayPal platform, including Braintree, Venmo and Xoom, enables consumers and merchants to receive money in more than 100 currencies, withdraw funds in 56 currencies and hold balances in their PayPal accounts in 25 currencies. For more information on PayPal, visit https://www.paypal.com/about. For PayPal Holdings, Inc. financial information, visit https://investor.paypal-corp.com. 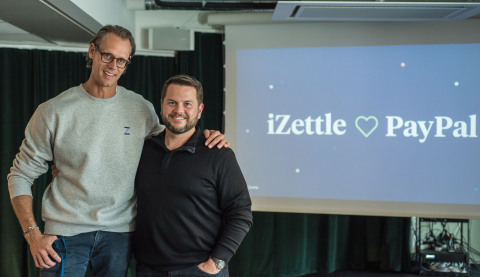 iZettle is on a mission to help small businesses succeed in a world of giants. Founded in Stockholm in 2010, the financial technology company revolutionised mobile payments with the world's first mini chip card reader and software for mobile devices. Today iZettle's commerce platform for small businesses in Europe and Latin America provides tools to get paid, sell smarter and grow your business. Find out more information about iZettle's small business community at https://www.izettle.com. This announcement contains "forward-looking" statements within the meaning of applicable securities laws. Forward-looking statements and information relate to future events and future performance and reflect PayPal's expectations regarding the impact of this transaction on PayPal's and iZettle's financial and operating results and business, the operation and management of iZettle after the acquisition. Forward-looking statements may be identified by words such as "seek", "believe", "plan", "estimate", "anticipate", expect", "intend", and statements that an event or result "may", "will", "should", "could", or "might" occur or be achieved and any other similar expressions. Forward-looking statements involve risks and uncertainties which may cause actual results to differ materially from the statements made, and, accordingly, readers should not place undue reliance on forward-looking statements and information. Factors that could cause or contribute to such differences include, but are not limited to, the reaction to the transaction of iZettle's customers and business partners, the reaction of competitors to the transaction, the retention of iZettle's employees, PayPal's plans for iZettle, including the possibility that integration may be more difficult than expected, the timing and possible outcome of CMA's review of the transaction, economic and political conditions in the global markets in which PayPal and iZettle operate, and the future growth of PayPal's and iZettle's businesses. More information about these and other factors can be found in PayPal Holdings, Inc.'s most recent Annual Report on Form 10-K, Quarterly Reports on Form 10-Q, Current Reports on Form 8-K and other filings with the Securities and Exchange Commission (the "SEC"), and its future filings with the SEC.